A banner left on a sidewalk in Hong Kong on Thursday wishes Google well. Chinese Foreign Ministry says it supports development of Internet "according to the law"
Washington (CNN) -- The United States plans to express formal concern to the Chinese government soon after Google said a cyber attack from China targeted human rights activists. 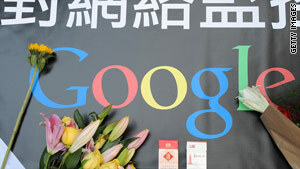 The attack prompted Google to threaten to close its Chinese site. It also led Google to stop limiting search results in China, which let users access information about topics that are sensitive to the Chinese government, such as the crackdown in Tiananmen Square in 1989. However, censorship of Google results quickly re-appeared. The U.S. government plans to issue a demarche -- a formal diplomatic message - conveying concern to the Chinese government, probably one day early this week, State Department spokesman P.J. Crowley said. "It will express our concern for this incident and request information from China as to an explanation of how it happened and what they plan to do about it," he told reporters Friday. Google said last week that a "highly sophisticated and targeted attack" from China targeted it and the e-mail accounts of at least 20 others, evidently to access the e-mail accounts of human rights activists in the United States, Europe and China. The attackers routinely gained access to the e-mail accounts of dozens of activists, according to a statement from David Drummond, senior vice president of corporate development and chief legal officer for Google. The Chinese Foreign Ministry said it supports the development of the Internet "according to the law" and that its measures are in line with international practices. "I stress that China's Internet is open," Foreign Ministry spokeswoman Jiang Yu said. "The Chinese government works hard to encourage the healthy development and expansion of the Internet, and works to create a favorable environment for that." She said Google's claims "raised very serious concerns and questions." Since Google started operating in China in 2006, the company has censored thousands of search terms, the company acknowledges. Last week, however, just hours after Google said it would stop limiting search results, users in China were accessing information that previously had been off limits on Google.cn, the company's Chinese search engine. People could retrieve information about the Dalai Lama and the banned Falun Gong movement -- sensitive topics to the Chinese government. A search for "Tiananmen Square" that once would return only images of the square itself suddenly had information about the Chinese government's crackdown on pro-democracy activists in the square in 1989. The search results were censored again within a day or so. White House spokesman Robert Gibbs said the United States plans to formally express concern to China because President Barack Obama believes in "the universal value of a free Internet." He said the United States has "concerns" about the Google incident. "We need to hear now from the Chinese," he said.